The Union Ministry of Road Transport and Highways will observe the 29th road safety week from 23rd April 2018. The road safety week was inaugurated by the Union Road Transport Minister Nitin Gadkari in New Delhi. 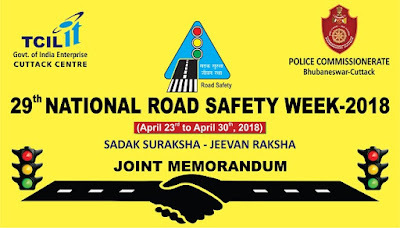 The theme for the road safety week for 2018 is “Sadak Suraksha – Jeevan Raksha”. Motor vehicles’ population is increasing at a rate of 10% every year. Rising traffic on roads and resultant accidents were one of the leading causes of death, disability and hospitalization among people. Around 1.5 lakh people lose their lives in road accidents in the country every year, which causes economic hardships and emotional trauma for the families. Studies conducted by the Union ministry show that 78% of road accidents occur due to the fault of the drivers. The ministry has also proposed to provide a financial assistance of Rs 5 lakh and awards to NGOs, cooperative societies and other agencies for creating road safety awareness till March 31, 2020. The NGOs and cooperative agencies will have to submit the applications to the state transport commissioner. If the applicant is an NGO, it must be registered on DARPAN Portal of the Niti Aayog. The Union Ministry of Road Transport and Highways has directed all the state governments as well as organizations and departments associated with road safety, to create awareness about the traffic rules during this Road safety week. The government is focusing majorly on schools and commercial drivers and efforts are being made to start driving training centres across the country. The training centres will not just teach drivers’ the basics of driving but will also teach them the rules of road safety. The United Nations organization has already decided to observe the Road Safety decade from 2011 to 2020. This campaign is an effort to realize the concept of road safety.